Happy Saint Patrick's Day. 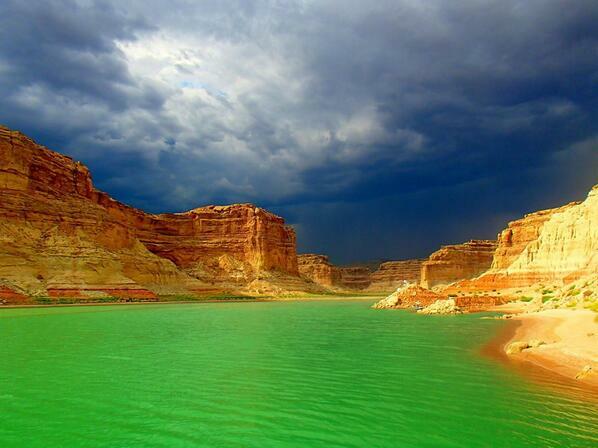 Lake Powell Tourism tweeted this photo, showing Lake Powell with emerald green water. Fun. Hope you have enjoy this day. The shuttle system in Zion National Park is set to resume operation on April 1. Until then, park officials expect heavy traffic and congestion in Zion Canyon. They provided this news release. Springdale, Utah- Zion National Park expects heavy traffic during the last three weekends of March as a result of spring break, beautiful weather, and Zion Half Marathon participation visitation. During March 15 and 16, March 22 and 23, and March 29 and 30, the park may implement active traffic control along Zion Canyon Scenic Drive to ensure visitor safety and mitigate resource damage. Park visitors should expect long lines at Entrance Stations and are encouraged to carpool. Zion National Park’s shuttle bus system does not begin operation until April 1, 2014. Currently, Zion Canyon is open to vehicular traffic and the high number of visitors is quickly filling the canyon’s parking lots. Visitors in the park on these dates should expect designated parking lots and pullouts along the Scenic Drive to fill up quickly. For the protection of park visitors and park resources parking outside of designated areas is not permitted. During weekends in March, if it becomes apparent that visitation exceeds parking availability on the Scenic Drive, rangers will proactively manage traffic on the Scenic Drive. Traffic control measures could include 1-2 hour periodic closures at the turn off onto the Scenic Drive from Highway 9. Vehicles parked outside of designated areas pose potential safety hazards to other vehicles, impede emergency response, and can cause resource damage to roads, drainage systems, and vegetation. Vehicles parked outside designated areas, on vegetation, or blocking or restricting the movement of vehicle traffic may be cited. Visitors to Zion Canyon should be prepared to visit other areas of the park or to park farther than usual from their expected starting point and may find parking is full. The carrying capacity of Zion Main Canyon poses an ever increasing challenge to park management. While the shuttle system, implemented in 2000, addressed much of the challenge, annual visitation continues to increase and the busy season to grow longer. Park management is currently involved in a transportation study and is considering the possibility of expanding shuttle services in 2015.